Passed December 23. An ACT to alter such parts of the constitution and form of government as prevent a citizen from taking a seat in the legislature, or being an elector of the senate, without taking an oath to the support of this government. Parts of the constitution repealed, &c. II. Be it enacted, by the General Assembly of Maryland, That all those parts of the constitution and form of government that prevent a citizen, conscientiously scrupulous of taking an oath in any case, and who are permitted by the constitution to affirm in certain cases, from taking a seat in the legislature, or from being an elector of the senate, without taking an oath of support to this government, shall be and hereby are repealed, abrogated, and made null and void; and hereafter a solemn affirmation or declaration of support to this government may be taken, and shall be received in stead of an oath, by any citizen chosen a delegate or elector of the senate, conscientiously scrupulous of taking an oath in any case, and who is permitted by the constitution to affirm in certain cases. Passed December 23. 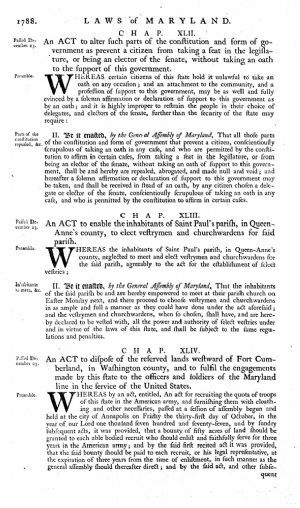 An ACT to enable the inhabitants of Saint Paul's parish, in Queen-Anne's county, to elect vestrymen and churchwardens for said parish. Inhabitants to meet, &c. II. Be it enacted, by the General Assembly of Maryland, That the inhabitants of the said parish be and are hereby empowered to meet at their parish church on Easter Monday next, and there proceed to choose vestrymen and churchwardens in as ample and full a manner as they could have done under the act aforesaid; and the vestrymen and churchwardens, when so chosen, shall have, and are hereby declared to be vested with, all the power and authority of select vestries under and in virtue of the laws of this state, and shall be subject to the said regulations and penalties. Passed December 23. An ACT to dispose of the reserved lands westward of Fort Cumberland, in Washington county, and to fulfil the engagements made by this state to the officers and soldiers of the Maryland line in the service of the United States. 1788, Allegany and Garrett Counties, Maryland.